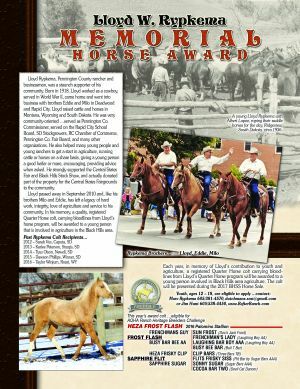 RAPID CITY, SD – Applications are open through January 21, 2017 for a chance to win a registered Quarter Horse colt from a reputation horse breeding family. The Memorial Colt Award made possible by the Lloyd Rypkema family of Rapid City, SD, is presented to the entry that best personifies the western and ranching spirit. Since his passing, the family of the late local rancher and public statesman have worked to keep his legacy alive by holding an essay contest to award a boy or a girl from the five state area, a colt from the Rypkema herd to own and care for. This year’s colt “Heza Frost Flash”, is a 2016 Palomino colt going back to “Frost Flash” and Sapphire Flit”, and is eligible for the AQHA Ranch Heritage Breeder’s Challenge. Youth ages 12-18 are encouraged to enter. The winner will be presented the colt during the annual Black Hills Stock Show Horse Sale held in the Rushmore Plaza Civic Center. Contact Marv Rypkema at 605-381-4570 or Jim Hunt, Open Box Rafter Ranch at 605-538-4450 for more details. Past recipients include Taylor Winjum, Rozett, WY in 2016; Dawson Phillips, Winner, SD in 2015; Tyrus Olson, Newell, SD in 2014; Karlee Peterson, Sturgis, SD 2013; and Sara Vos, Caputa, SD 2012. The deadline to apply is Saturday, January 21, 2017.